17-Nov-2008 -- This is the 44th of a series of 83 confluence visits during our voyage from Nigeria to Europe and back to Nigeria around the entire African continent. It all started on 28 January at 11N 5E. Story continues from 30N 31E. After spending one night in the black desert outside the town of al-Bawīṭiy and one night in the white desert, which is 45 km before the oasis al-Farāfira, we visited this Confluence. The Confluence is several kilometres outside the town and is 3 km from the main road. Between the main road and the Confluence is an oasis, which we drove around. 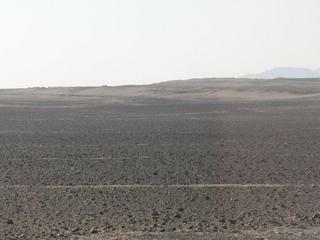 The remaining distance was straight forward open plain desert. On the way back we replenished our water reserves and continued to the next Confluence 26N 28E.